Usually, the first question can be decided pretty easily; if I have creatures out, I’m most likely going to spare one. The second question can sometimes feel like Sophie’s Choice (if you don’t understand that reference, please Google it because the thought of needing to explain it makes me feel old). You need to measure the current tone of the game. If you’ve been behind and just need some breathing room, you might spare a creature with some sort of strategic ability to it like Vorinclex, Voice of Hunger. 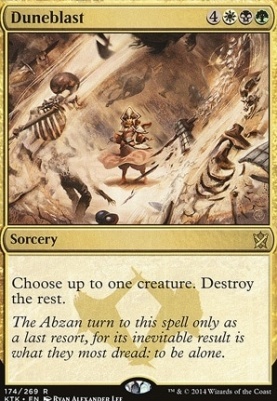 If you’ve been struggling to get the damage through and are playing your boardwipe in order to hit someone in the face, you may pick something like Akroma, Angel of Wrath. You may just be playing Duneblast as a way to get the board back to a reasonable position. We all know how chaotic multiplayer games can get. If that’s the case, you would probably want to pick something that could let you rebuild your forces quickly and give you control over the rest of the game, like Mycoloth. The choice is yours.